Andrew Crofts and Mark McCrum spoke entertainingly about their specialism, ghostwriting, at a Society of Authors talk in Piccadilly last week. They have written a huge variety of autobiographies and memoirs on behalf of people with stories to tell, from pop stars to soldiers to adventurers to victims of abuse. Though it sounds like a job that can be fascinating and occasionally well rewarded, it seems the gold-rush days are over. Not so long ago, for penning Robbie Williams’ life story you could have got £200,000 up front and royalties that started at £100,000. However, in today’s shrivelled publishing landscape, huge advances and generous royalties are rare. The two writers also outlined the frustrations of the work. Subjects who decided they don’t like your writing, celebrity egos and the ‘beauty contests’. This is where several writers are paraded before a celeb, who then picks whoever he/she finds least offensive. However, the upside is that the work can be fascinating. Travelling the world meeting extraordinary people with remarkable experiences to relate clearly beats most office jobs. Not all the subjects are laudable. Crofts, whose manual on ghostwriting is quoted in Robert Harris’s thriller The Ghost, talked about various dictators and criminals he has ghosted for. His advice on this is straightforward. You don’t have to like or admire the person. If they interest you, take the work. If not, walk away. The ghostwriter’s role is to find their subject’s voice and give shape to their story. It is also to be a reassuring presence through the process. Revealing yourself in print can be daunting. I think it was Mark McCrum who brought up the huge advance Sean Connery got for his memoirs, only to pull out when it came to actually dredging through his own past. McCrum also gave an amusing account of traipsing after Robbie Williams during some world tour, trying to extract the star’s story. He was horrified to subsequently realise his contract stipulated that he had to pay for his own accommodation. All those five-star hotels set him back around £18,000. The lesson here was to ensure you and the Society of Authors go over contracts with a beady eye. I am currently exploring a writing project on behalf of somebody with a newsworthy story and found the evening absorbing. Despite the celeb egos and contractual horrors, the humour and enthusiasm of Crofts and McCrum made such collaborations seen an intriguing prospect. 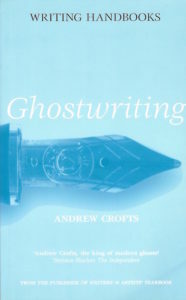 This entry was posted in Writing and writers and tagged Andrew Crofts, Ghostwriting, Mark McCrum by admin. Bookmark the permalink.